This is the first summer since I started college Fall 2009 that I have had off. Crazy, huh? Five years straight and luckily I have a brand spanking new Masters degree to show for it. But now it’s time for me to branch out and bust out all the things I had been putting off since starting architecture school. Right now I’m trying to branch out and try things I’ve never done before. 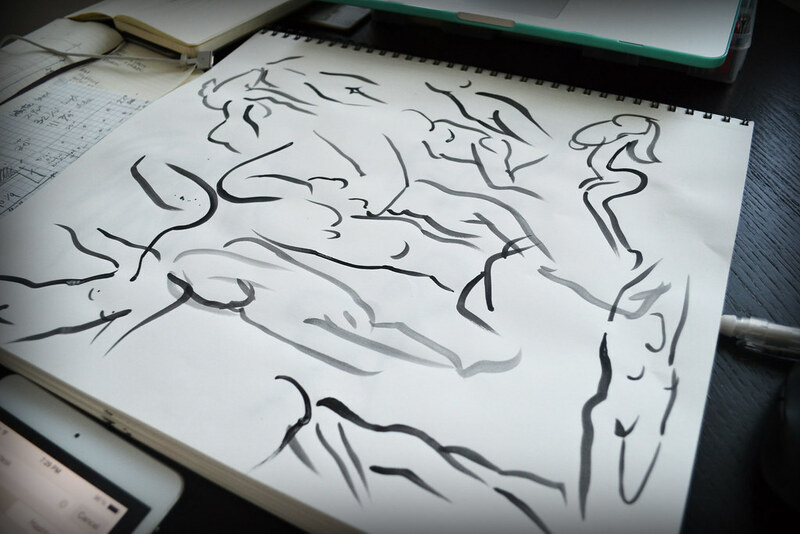 I chose to start off with figure drawing. While surfing the interwebs I found artists.pixelovely.com, this really cool site that creates a sort of figure drawing class scenario. They give you options as to what type of models, how long each pose lasts and how long a session you want to do. I chose “class mode” which covers 16 poses total, starting with 10 poses for 30 seconds. Having never done a figure drawing class, I wasn’t sure what I was getting into. When the first image popped up I thought for about 10 seconds, trying to find the main elements and then started painting. Before I knew it the 30 seconds were over and it was time for the second pose. I was seriously not ready. All I can say was that the whole situation was pretty stressful but I will try it out again because I loved the final result. I just need practice. The drawing above is what I drew in those first ten poses and my friend made me feel better about it by telling me that that’s what most 30 second pose drawings look like. Phew. Other than that I’m working on designing a tufted headboard for my sister’s newly organized room. This is a project that has been on my mind for years and I’m really excited to try it out. More on that soon.